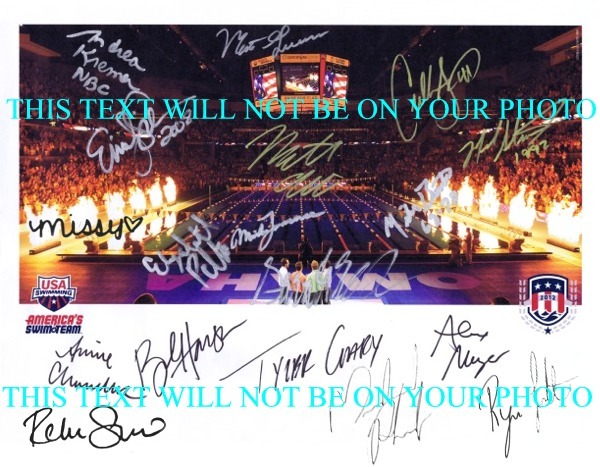 Excellent professional autographed picture of 2012 USA OLYMPIC SWIMMING TEAM AUTOGRAPHED BY 18 "MISSY FRANKLIN, MICHAEL PHELPS, RYAN LOCHTE, MATT GREVERS, REBECCA SONI, CULLEN JONES, NATHAN ADRIAN, MIKE BURTON, ALEX MEYER, EMILY SILVER, ANNIE CHANDLER, TYLER CLARY, MORE SWIMMERS SIGNED BUT NAMES NOT RECALLED AND EVEN NBC REPORTER ANDREA KRAMER. This professionally printed photo is of fantastic quality, cannot tell it apart from the original, high clarity and comes in a clear firm photo protector, you won't even need to frame it. Autographs of all are preprinted within the glossy 8x10 and shipped very secure, waterproof with a clear firm plastic photo protector and includes a certificate and guarantee. Makes a great gift. Price includes shipping. THIS TEXT WILL NOT BE ON YOUR PHOTO text will not be on the photo you receive.